Remember Gutenberg? It’s the new editor for WordPress, slated to be integrated into version 5.0 (currently 4.9.8). 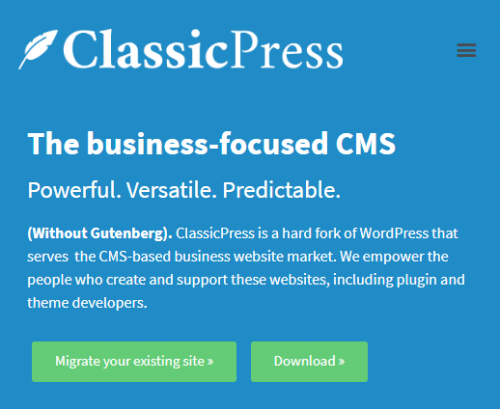 Gutenberg lays the foundation for an all-encompassing overhaul of WordPress itself. Initially it will be similar to a simplified version of a page-builder, but over time the paradigm it establishes will be incorporated into the rest of the WordPress back-end, changing how sites are built and managed. So, is that a good thing? Yes. No. Maybe? It depends on so many factors and—unfortunately—a lot of unknowns. Let’s start by looking at how WordPress does things now. If there’s one thing we developers have all learned the hard way, it’s the importance of separating content from styling, and modern web coding languages are built around that principle. What do I mean by that? Well, just a quick example would be a scenario where you wanted to change all the section headings on your site to be red: do you want to have to go through and edit each heading, one-at-a-time? Or change one setting and have all of them update? Right, so keep them separate. In a sense, the current approach WordPress takes falls neatly in line with this principle. At its simplest, WordPress handles the content, and the theme handles the layout. Gutenberg (like other page-builders), changes that by integrating layout directly into the content editor. And it’s no surprise that a large portion of the development community sees that as a major misstep. Is WordPress a Content Management System or a Website Builder? WordPress started its life as a blogging platform and it didn’t really do much else, but it has grown to be a full-fledged content management system (CMS). Which, in our own words, “puts the control in your hands. You are able to update existing pages and add new pages, images, PDFs, and whatever else you may dream up at 3 a.m.” Today WordPress powers nearly every type of website imaginable. It has maintained an astonishing balance between simplicity, flexibility, and extensibility. But now it faces a new type of competition that is gaining market share: website builders, such as Squarespace, Weebly, and Wix. The promise of these sites has an obvious appeal: “design your perfect website without a single line of code.” And the promise is true, it just isn’t the whole story. Remember that content/layout separation we just talked about? What if you’ve just laid out 20 pages with the main image below the title and then you decide you want it above the title … guess what you have to do now. Will it be successful? There are certainly some notable success stories in the history of software forks. But there are thousands more none of us have ever heard of—for good reason. But guess what? WordPress was a fork of b2/cafelog back in 2003. So you never know. Probably more significant though, is the level of backlash a formal fork like this represents. It’s impossible to say for sure how much of the WordPress development community would actually consider mutiny (the numbers on the associated petition are not overwhelming), but there is at least a vocal minority ready to take a stand. Everyone knows Gutenberg is going to be disruptive. What no one knows for sure, is if it will breathe new life into the WordPress ecosphere, or if it will mark the beginning of the end. What we can say, is that there’s no need to panic. Even once WordPress 5.0 is released, there are options to keep the status quo for the time being. That will give us all the opportunity to evaluate the best next step for our WordPress sites, whether that’s moving to a fork, moving to a different platform, or making some adjustments to get the full benefit out of the shiny new Gutenberg features. If you have any concerns or questions about how these upcoming changes will affect your site, don’t hesitate to get in touch with us. ClassicPress could be a possible future. But it takes many developers love the true opensource to create new advanced plugins.